Why get this Worksheet ? To engage your kids to learn more about Islam . As a basic questionnaire to gauze the level of understanding of deen of your student . 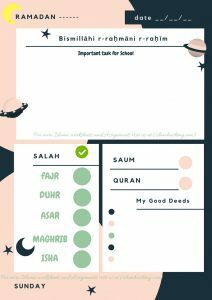 This 5 Pillars of Islam Worksheet PDF can be downloaded printed in a A4 Sheet and can be used by the teachers and Parents as assignments for Kids . You can encourage teach them the 5 pillars of Islam and encourage them to write the answer in their own words . The Parents/teacher can then asses the assignment and keep it in a folder .